Infrared heating is the heating of the future, available to you now. Set to supersede conventional central heating systems this new and exciting form of heating for both the home and commercial set ups is fast gaining notoriety as one of, if not the best ways to heat your home in a flexible, cost efficient manner. 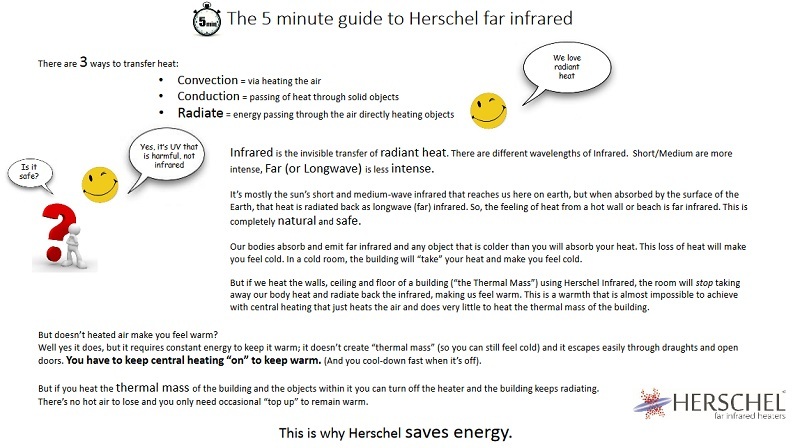 To understand why infrared is so different, and so energy efficient, you need to understand a little bit about the way conventional radiators work first. Your current central heating system warms your rooms through simple conduction and convection - meaning that you warm the air which rises and creates a cycle within the room, heating the top of the room first and filtering down and warming you. Our infrared panels heat in a completely different way. Instead of attempting to warm the air they emit far wave infrared rays of the optimal wavelength for heating. They offer a more focused, directional heat which warms objects instead of the air in the room. These objects include furniture, walls, other objects and of course, people! This means that the infrared panels have to heat a much smaller mass compared to your current radiators. Intuitively this requires less energy which is one reason the panels are so efficient. In addition to the heat you get from the panel, the objects which have been heated such as tables, chairs, walls, etc. then themselves begin to radiate heat which helps further warm the room, and speeds up heat distribution within the room. This residual heat within the objects means that the room reaches temperature much quicker when used daily - this is another reason the infrared panels are so efficient - they require less energy to bring the room up to your desired temperature. Flexibility - Our infrared panels come in a wide array of sizes. From simple white panels which if you wish can be painted to either match your wall to create that "invisible radiator" feel or due to their canvas like appearance, treated just like a canvas and an artistic painting done on them to turn your radiator in to a focal point of the room. They come in a wide variety of finishes including mirrors (ideal for hallways and of course bathrooms), digitally printed artistic prints, stunning glass fronted radiators and much more. Infrared radiators are also unrivalled in their flexibility of positioning. Whereas generally speaking conventional radiators should go under windows you can put your infrared radiator just about anywhere you like. This includes positioning them in the ceiling - a great space saver - or anywhere you like on your wall. All you have to be able to do is screw four holes and you can position your panel there. Ease of installation - Our infrared radiators come with a 3-pin plug as standard which means they are really plug and play if you want them to be. If you can hang a picture on the wall you can install an infrared panel. In addition to a simple plug and play install the panels can be wired in directly to your electricity circuit which allows for some extremely sophisticated levels of thermostatic and timer control. These start as simple as simple one thermostat one panel set ups, up to whole house set ups where you control your heating independently in every room using your smart phone. Maintenance free - Infrared panels contain no moving parts, they do not stir up or attract dust which can affect other forms of heating. As a matter of fact, our market leading brand Herschel boasts an impressive record whereby they have not had a single panel fail post manufacture. Based upon the materials used and tests performed Herschel estimate the theoretical life span of their panels is approximately 130 years. Installing infrared could be the last change to your heating system you ever make. Near 100% energy efficiency - nearly 100% (99%+) of the electricity used by far infrared panels is converted in to heat. Due to the lack of moving parts, clever design and the nature of the technology the energy is converted with remarkable efficiency. This is in contrast to up to 30% heat loss on a water central system, up to 50% on a oil based system and as much as 60% heat loss on storage heaters. Infrared is natural heat - The far infrared given off by our panels is within the same wavelength as the heat for the sun, this makes it natural heat and it also means that it comes with a number of health benefits. Due to the deep heating effect of infrared it can stimulate blood flow and reduce the symptoms of arthritis, inflammation and muscle soreness. This is why infrared saunas are routinely used by the NHS to help treat/manage such conditions. No conduction/convection cycle - Unlike conventional heaters which work by conduction and convection, heating the top of the room first with the heat working its way down to you as the area warms, infrared creates responsive heat without the need for conduction or convection. There is a key health benefit to this - convection causes air movement which draws dust and other allergens in to the air. This makes infrared an ideal choice for those with asthma and other respiratory related problems.